The Melbourne Cup is an annual horse race held in Melbourne, Australia. It's known as "the race that stops a nation", and people from all over Australia like getting involved in the fun. It is held on the first Tuesday in November, and began in 1861. People normally celebrate the day of the Melbourne Cup by dressing up. At the event, prizes are given to the best-dressed man and woman. This has inspired viewing parties and other Melbourne Cup events to include a bit of flair and fashion. This year, five of our schools in Australia took part in the festivities. Even if everyone couldn't attend the event, there is still loads of fun to have with friends at school, as we learned from our students this month. 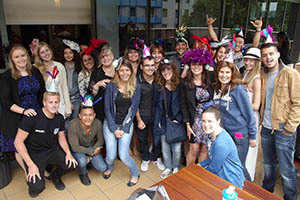 Melbourne celebrated with a Best-Dressed Competition, in which students put on their nicest outfits, and their best fascinators and celebrated the day. Sydney's patio catwalk was a big draw for the fashion-forward, with a chance to show off their home-made hats and summer style. In Cairns, teachers and students got into the fun with their take on Aussie fancy/casual. Perth's Melbourne Cup fashion show featured hats, dresses and even shorts, plus two lovely winners. Sydney Manly had their own horse race, plus the teachers got into the fun with a fancy hat competition! How would you celebrate Melbourne Cup? If you were to make a fancy hat, what would you put on it?